Tell about your local and state laws for owning and using archery equipment. Explain the following terms: cast, draw weight, string height, aiming, spine, mechanical release, and barebow. How the five-color World Archery Federation (FITA) target is scored. A World Archery/ USA Archery indoor round I and make a score of 80 points. An NFAA indoor round and make a score of 50 points. As a member of the USA Archery Junior Olympic Archery Development Program (JOAD), earn your indoor or outdoor green, purple, and gray achievement award pins using a compound bow. A World Archery/USA Archery indoor round I and make a score of 90 points. An NFAA indoor round and make a score of 60 points. As a member of the USA Arcchery Junior Olympic Archery Development Program (JOAD), earn your indoor or outdoor green, purple, and gray achievement award pins using a compound bow..
Archery. 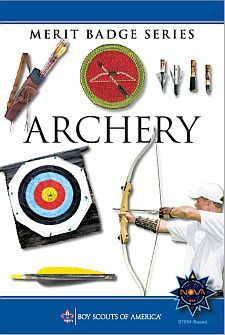 Archery activities must be supervised by a BSA National Camping School-trained shooting sports director or USA Archery or National Field Archery Association instructor, or by someone who has been trained by one of the three; or alternatively, the activities may be supervised by someone with at least Level 1 training in the operation of an archery range from USA Archery, NFAA, or an equivalent.